How’s the stadium construction going? 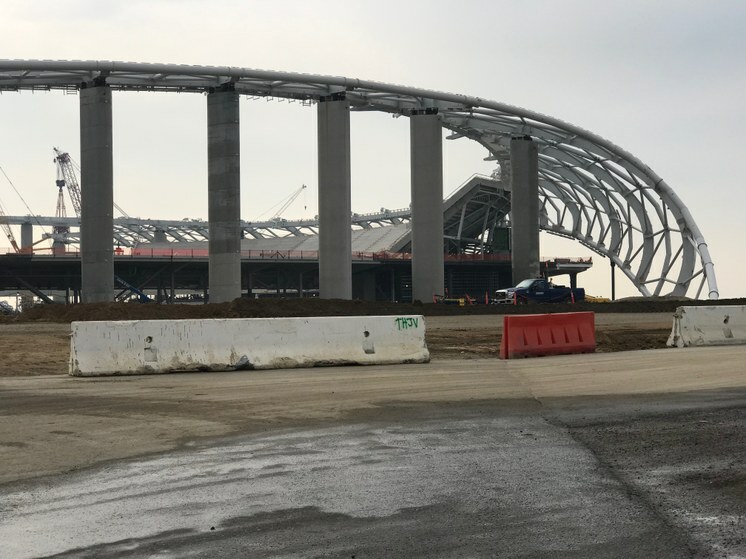 It’s now 60 percent complete, and on track to open just before the 2020 season. You can see the massive concrete pylons and skeletal frame of the swooping roof structure. That will be covered in a light plastic material called ETFE, and will offer partial coverage of the bowl. You can also the raked sides of a bowl that will seat over 70,000 fans. It’s worth noting though that even though it’s impressive, it doesn’t feel as high and gigantic as a usual stadium would be and that’s because it is sunk 100 feet down into the ground. It goes right under LAX’s flight path so it had to go low. But it still gives you that sense of awe you get from stadiums, going back to Rome’s colosseum. How are neighbors of the stadium feeling about this? Well, it really depends who you talk to. Lots of locals are super-excited; this new stadium and the arrival of the Rams is a huge boost for Inglewood, and the Rams playing in this weekend’s Super Bowl only adds to that. Thousands of people lined up for a go-Rams event this Sunday -- and this is a town where you find people who are still loyal to the LA Raiders. For Mayor James Butts, who was re-elected with two-thirds of the vote to a third term, this project is a massive economic injection. “This project will be about a $7 billion development, could be as much as $10 billion. So now what do we have? We have jobs. We have the future prospect of ticket taxes, sales taxes, parking taxes. And it’s anticipated that this project within 5 to 7 years will generate about $42 million dollars additional revenue for the general fund,” Butts said. Locals though do have complaints, including traffic. Some say the town is focusing too much on sports and not enough on other civic needs. There are complaints about handouts to developers, in the form of reimbursements to developers for the cost of access roads and infrastructure. Not for the stadium construction costs though which are being paid by the team’s owners. Then there’s the growing criticism of football itself. It’s harder these days to be overly-enthusiastic about a game that smashes people’s heads in. Then off course there’s the rent. How about the concerns over gentrification? Rents in the area are skyrocketing -- up 12% since 2016, according to the real estate data firm CoStar. That’s almost twice the countywide average. And the poverty rate in Inglewood is 25 percent. Property values meanwhile have shot up more than 37 percent. So that makes homeowners cheerful but puts the purchase of homes out of reach for many locals. The construction site for the new Rams and Chargers stadium in Inglewood. Photo by Frances Anderton/KCRW. But isn’t there going to be new housing at the stadium? Yes, the stadium will itself bring housing; 2,500 new housing units are to be on the site but all of it will be at market rate. Mayor Butts will point out that these rising costs to the community will be offset by the project’s many benefits and jobs. In addition to the football stadium and housing there will also be office buildings, shops, restaurants, residential units, hotels and parks. And a 6,000-seat performance center. And 25 acres of park and a lake. The project has far more uses attached than stadia in the past. The goal is to make it a 24/7 destination that is more urban than suburban. Remember stadia often become little used black holes in the urban fabric. So sports is just one part in a complex that the Washington Post reports is 3 ½ times the size of Disneyland and twice as big as Vatican City. And it needs to get done because LA needs the stadium to host the 2022 Super Bowl and events at the 2028 Olympics Games.